If you're a Parks and Recreation fan, there are three things you know about Nick Offerman's Ron FREAKING Swanson. One, he's a government worker who hates the government. Two, he has a rich and glorious moustache that should get its own billing. Three, he is something of a foodie. Carefully folded into Parks and Recreation's two seasons are weird and hysterical hints of Ron Swanson's sybaritic predilections. 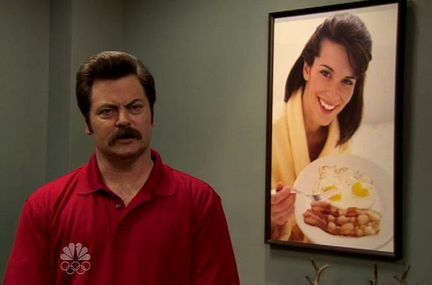 Like, hanging in a place of honor on his office wall is an enlarged stock photo of a plate of eggs. (Breakfast foods are one of his great loves.) And? During a Halloween party, he can be seen tweezing almonds out of the mini Almond Joys because almonds "give [him] the squirts." 1. Using a small spoon, carefully remove all the cooked yolks and dump them in a bowl. Add the mayonnaise and chipotle Tabasco sauce and mash with a fork until smooth and combined. 2. Dice the bacon and cook over medium-high heat until crisp. Remove bacon pieces with a slotted spoon and place on a paper towel-lined plate to dry. 3. Add the scallions, salt, and pepper to the yolk mixture and stir to combine. Carefully fold the bacon pieces into the yolk mixture. 4. Fill the egg hollows with the filling and top each egg with a whisper of cayenne. OPTIONAL: perch Ron's #3 food (shrimp) on top of the filling for a truly decadent result. Tiny prawns or bay shrimp work best.